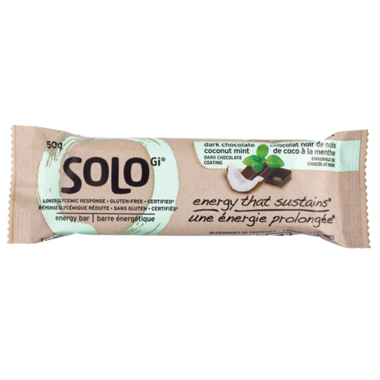 With the perfect balance of coconut flakes and a hint of refreshing mint, SoLo Gi bar is sure to knock you right out of your shoes! Combined coconut and mint with a soft, fudgy base with hidden little bits of cookie pieces inside, we bet you can’t just take one bite! Deliciously refreshing – this bar is perfect before a long bike ride or as an afternoon snack to provide a little pick me up. Your taste buds will thank you! Ingredients: Solo GI® Protein Blend [whey protein ISOLATE, whey protein CONCENTRATE, soy protein isolate, COCOA soy crisps (soy protein isolate, ALKALIZED COCOA, TAPIOCA STARCH)], BROWN RICE SYRUP, DARK CHOCOLATE COATING (SUGAR, PALM KERNEL OIL, COCOA POWDER, WHOLE MILK POWDER, SOY LECITHIN, SALT), ALMONDS, fruit puree (white grape juice concentrate, prunes, dates, fructose), BEET SYRUP, CHICORY FIBRE, COOKIE PIECES (SUGAR, ALKALIZED COCOA, CORN FLOUR, CORN STARCH, CANOLA OIL, SALT, NATURAL FLAVOUR), COCONUT, alkalized cocoa, natural flavours, soy lecithin. These are really good bars. The texture is smooth and are a bit chewy with a hint of mint flavouring. They hit the spot when needed! These bars taste soooo good! They have other really yummy flavours as well. Satisfies my craving on those days when I really want a treat. These bars actually taste great1 Good texture and not overly minty. I'm pregnant and these have been helping me get through the 3pm caffeine craving/sugar crash.